Construction: Glass Reinforced Plastic (GRP) She has a glass fibre lay-up consisting of an outer gel coat and glass matting impregnated with resin. The foredeck and side seating section is bonded to the hull and she has mahogany thwarts, gunwales, rubbing strake and stem piece. 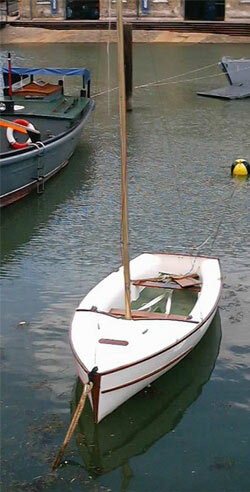 She has a galvanised steel drop keel and detachable rudder. Bosun was one of the first fibreglass boats designed to enter service with the Royal navy. She was one of many used by the Royal Navy for recreational sailing. Being built in 1964 and was in use between then and 1996 when she was taken over by the Trust.